Looking back on this year's events, it is only fitting that my last post of 2015 falls under the travel category. In a few words I can say that this was a year to be remembered. I spent half a year in China, graduated college, and landed my first full-time job, all the while losing and re-discovering myself along the way. 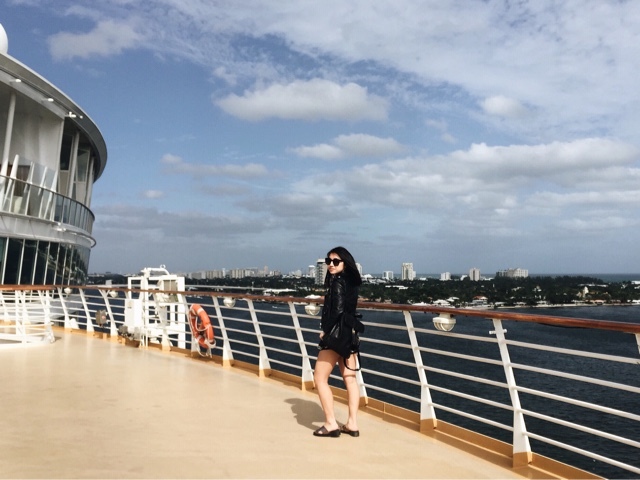 To conclude 2015 here on Looks by Lau, I'm sharing highlights from all three destinations on my recent Western Caribbean cruise. Let it be encouragement to continue exploring and discovering, as well as a hint about the posts to come at the start of 2016 (-wink-). And we're back at sea! 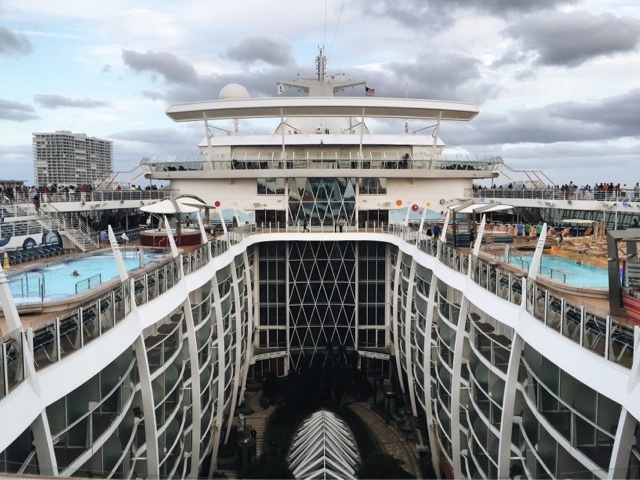 In celebration of my recent graduation from college, my family and I have set sail to three amazing destinations with Royal Caribbean. For that reason I will not be blogging until I return next weekend, but I wanted to drop by with an update to let you know of the exciting content to come. Until then, feel free to follow along on social media to find out where I'm headed! I wish you and your families all a wonderful holiday season. Let me know how you are finishing up 2015 in the comments below! We all know the saying. I spent this weekend visiting family in Virginia, where the temperatures seemed to bypass winter and hit the springtime 70's. With this unseasonably warm weather, I took the opportunity to bare some skin for the first time in months. Although I may have chosen the wrong location to attempt this look, as my aunt quickly noted that my outfit was not exactly the suburban norm. #NoShame. The arrival of December means the imminent flood of all things holiday, from streets lined with lights to endless loops of Christmas music on the radio. My favorite part about this time of year is the sense of togetherness it brings about. The holidays present the perfect time to reunite with loved ones and look back on the year that has passed. As an added bonus, these reunions usually create the opportunity to dress to impress as well. As long as I have been in New York, I rarely find myself heading south all the way to Battery Park City. I made a rare trip to the downtown waterfront this past Saturday to visit the Museum of Feelings, an installation made for emotional interaction. Despite the energy of this area between museum goers and crowds of ballet audience members, Battery Park City does not feel like Manhattan -- in the best way. There was a familial holiday spirit spread throughout the elegantly decorated space, in a way that felt like the suburbs again. I have spent 21 Thanksgiving weekends in Massachusetts with family, though I can't remember the last time we explored the city of Boston just a few minutes away. It is a strange but nice feeling to realize how quickly my cousins and I have grown. What was once a weekend of DIY board games has become college talks over brunch at the blink of an eye. 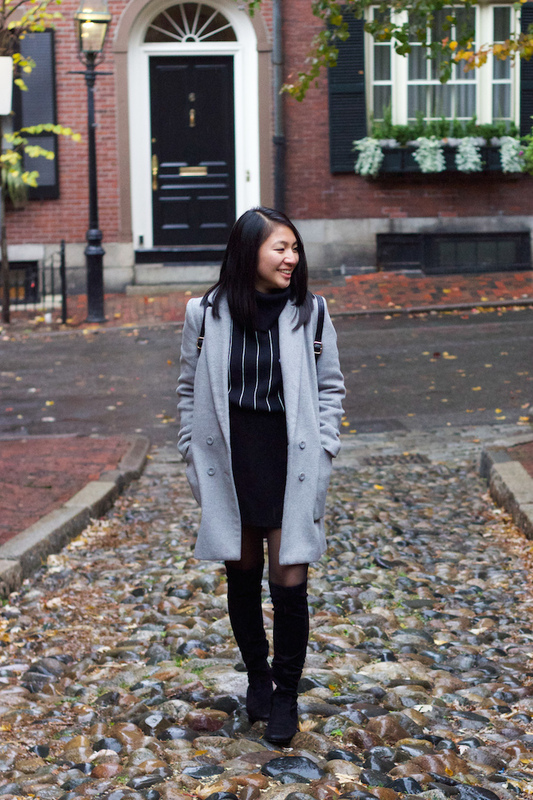 We finally spent this past weekend traveling through different areas of the city, with my favorite stop being the historic neighborhood of Beacon Hill. Surprised to see the color red on this page? As much as I lean towards a monochrome wardrobe, lately I've been searching for unique pieces to add some statement to my outfits. I will (sadly) be finishing up my internship at Tommy Hilfiger this week, so naturally I've taken every opportunity to use the last of that employee discount. Admittedly I debated for days before purchasing these bold suede booties, but to my own surprise I have not regretted the decision for a second. Judging from the amount of Instagram and blog posts I have from this single day, it is safe to say I've found a favorite New York destination. 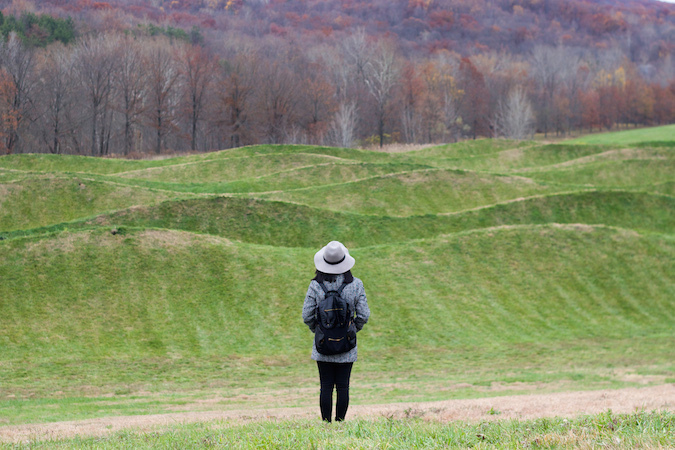 Just an hour north of Manhattan, Storm King Art Center provides the perfect opportunity to unwind and immerse yourself in both nature and man-made art. The space allows for sculptures and works of massive scale, with my favorite being Maya Lins' Wave Fields (shown above). I can only imagine how beautiful the area must have been at the peak of autumn. I can hardly believe we're a third of the way into November. Along with the early emergence of in-store holiday decor, it seems as if autumn is flashing by. I can personally attribute the rush of this season to the busiest semester of my college career. It has been one of nonstop work, but I just received news yesterday to prove that it is all paying off (updates to come soon!). In terms of personal style, this lifestyle has me turning to simple outfits with subtle pops of personality. Fun fact: In less than two months I will be finishing up my degree in Fashion Merchandising with minors in Art History and Asian Studies. 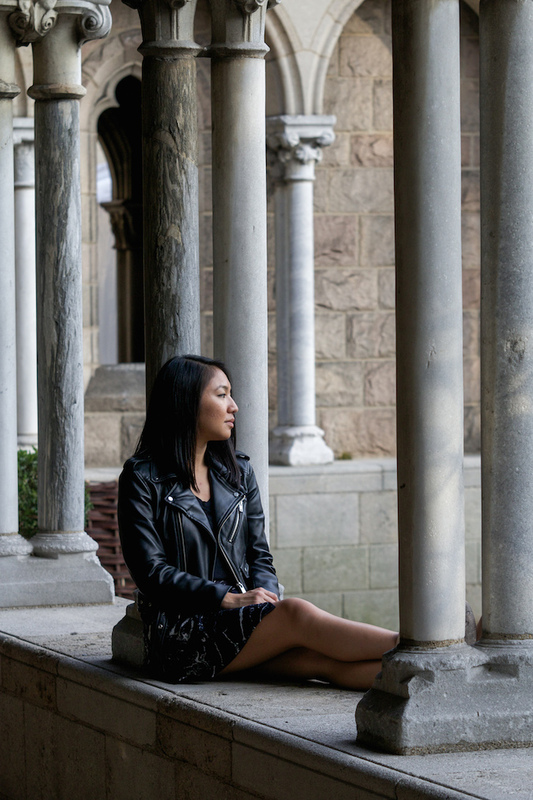 I recently took a trip uptown to The Cloisters art museum with my friend Arnold (also the photographer of this post), who despite having known for just five months, I feel like I have known for a lifetime. What I appreciate most is that he never fails to show genuine interest in my interests. We discussed everything from his dreams of marriage to my plans for the future, and today I thought I'd share some of the latter with you. Apparently I'm jumping early into the holiday spirit, because today I'm bringing you yet another fabulous giveaway! It wasn't until a friend of mine started working at a major eyewear retailer that I ditched my five-dollar Forever 21 shades for quality pairs. A great pair of sunglasses can do more than just make a statement. A quality piece protects your eyes while providing you with a classic accessory to last a lifetime (given you don't lose or sit on them..). Read on to find out how I style my new favorite pair of Le Specs sunglasses via Sunglasses Shop with a cozy-chic look. Be sure to enter my giveaway to win a pair of your choice as well! As the weather in the Northeast gets colder, my wardrobe strategy leans towards dressing up in the coziest way possible. Today's outfit is just one example of this idea, as it includes pieces that I could easily sleep in without actually involving pajamas. A simple cropped sweater and high waisted jersey pants make for an elegant combination that is guaranteed to keep you comfortable all day and night. An easy beauty and accessory upgrade quickly elevates this look above weekend loungewear. In this case, I curled my hair and threw on these lovely Le Specs shades to create a classic look fit for any occasion. I especially love these sunglasses because the frames keep it chic and unique to match any outfit I wear in the future. If any other silhouettes complement your style, Sunglasses Shop offers a wide range of brands from Ray-Ban to Dior for you to choose from. Here's to the moments that remind us to slow down, step back, and appreciate. I spent a recent weekend visiting family away from the city, and it quickly became just the escape I needed. As much as I love the vibrancy of New York, the city has its way of burning you out before you have time to hit the breaks. This particular trip was spent looking after my baby cousins and lounging around their quiet suburban home that sits on a lake. Over the course of the entire weekend there was no sense of hurry or need to fulfill a checklist of tasks. The rush of daily life stood still for just long enough to remind me to appreciate these small moments. A cozy weekend away calls for nothing but comfort, and I made sure to pack my bags as such. 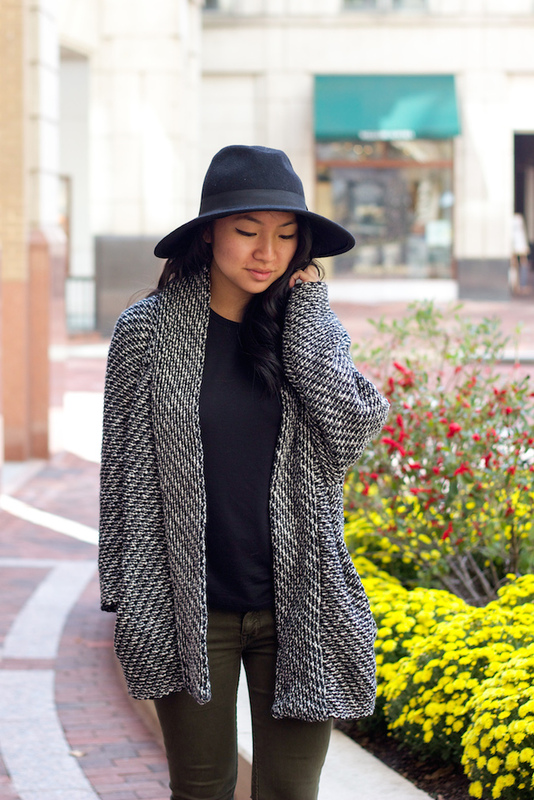 An oversized cardigan goes a long way in autumn, from outdoor layering to lounging around the house. I love this particular piece because its weight provides some extra comfort while maintaining style with the marled knit detail. 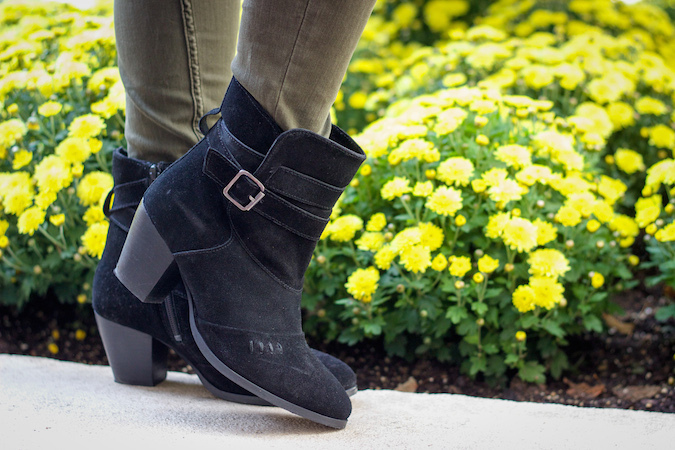 These slouchy suede boots from Skechers top off the cozy look, along with a low heel and simple details to match any outfit you might take on a trip. I wore this pair throughout a day of shopping around the town center, and my feet felt no discomfort by the evening. It's safe to say I'll be wearing these around the city quite often now! PS. Congrats to Kassie for winning my Coco & Marie necklace giveaway, and thank you to everyone who participated! There will be another one coming up very soon..
We made it! 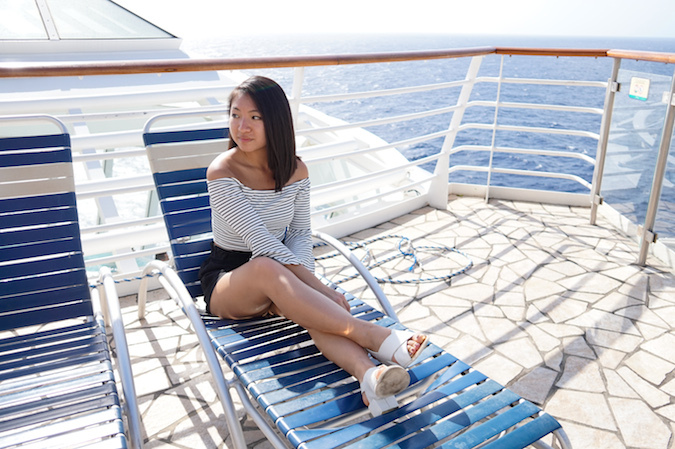 Today's post marks the last of my looks for The Coutourist Challenge, and I truly hope you've enjoyed and discovered some new styling ideas from this experience. 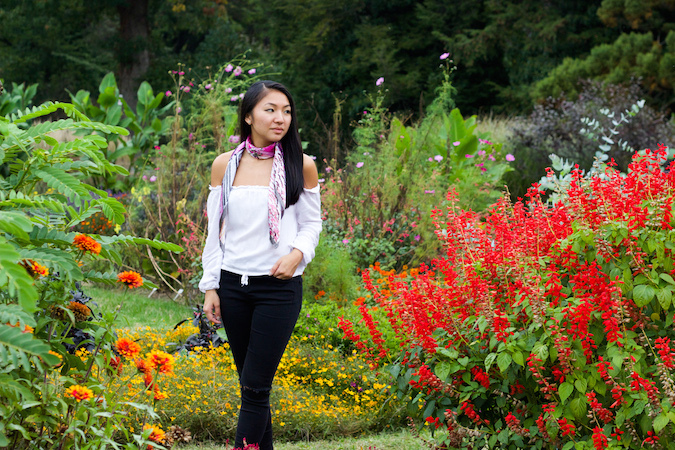 My final few looks are compiled together to show you how to take your Coutourist scarf through an entire day of travel in style, from packing your morning bag to that evening sip of wine. PS. Read the full post to find out how you can get free shipping + a surprise gift from Coutourist! There is no doubt that Hermès is the leader when it comes to scarf style, so I've recreated one of my favorite wraps by the iconic brand for this week's challenge. The night before any day of travel, I make sure to pack my bag with all the essentials to avoid rushing out the door the next morning. Next time you're prepping for the day, give your travel bag an upgrade by wrapping your scarf around the handles for that Hermès-inspired pop of color. As you venture out to your first destination, keep your hair in check against that morning breeze with a bold headscarf. 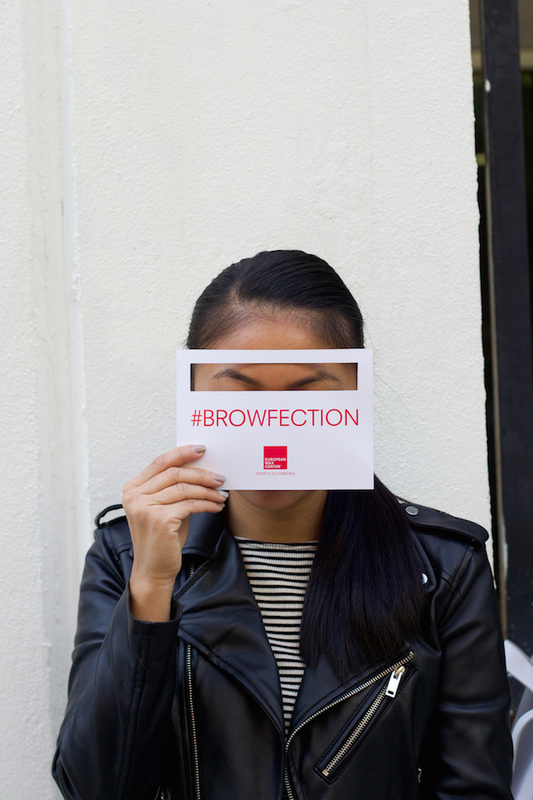 This easy look is also the perfect solution to staying photo-ready on an unexpected bad hair day. 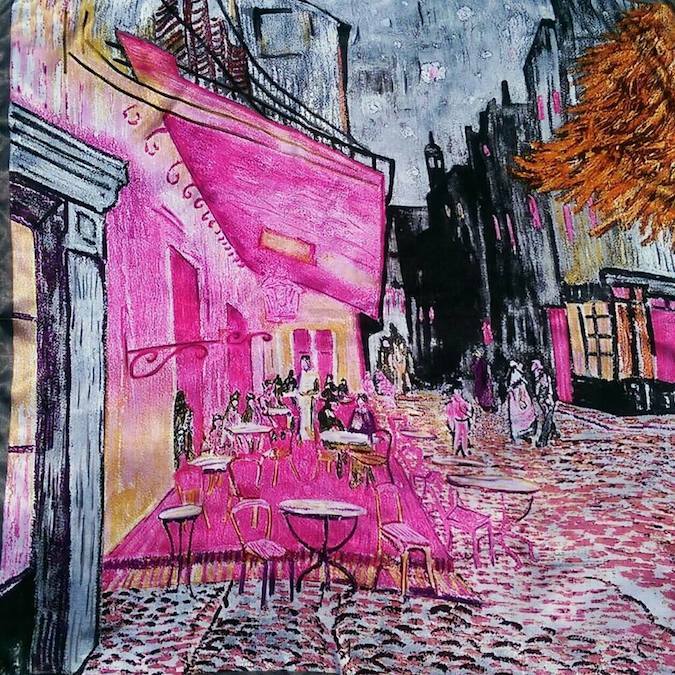 An afternoon of shopping is always on my itinerary for travel, and now your scarf can make it even easier. With two easy knots, the scarf becomes a lightweight bag to hold just what you need for a hands-free, seamless shopping trip. You can probably already tell that I prefer basic outfits when packing for travel, so a lightweight scarf ensures that no two outfits look the same. For this look I've tied my skinny fold into an infinity scarf to create a simple accessory with an eye-catching statement. After an afternoon of exploring, I like to take a short break back at my hotel to work on content and organize for the following days. 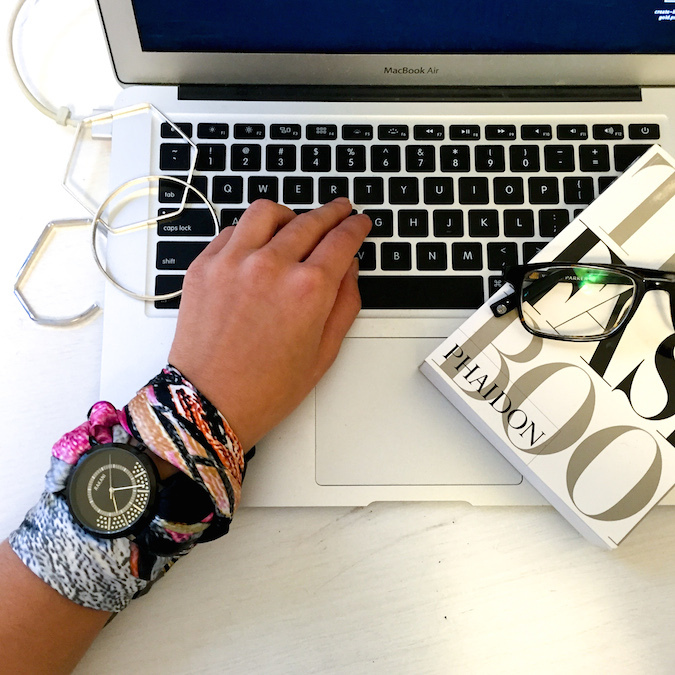 Wherever your workspace lies, stay on schedule in style by replacing your watchband with a silk scarf. The result is a colorful accessory that changes each new time you re-tie it. Finally, finish off your trip with dinner and wine in your best evening outfit. 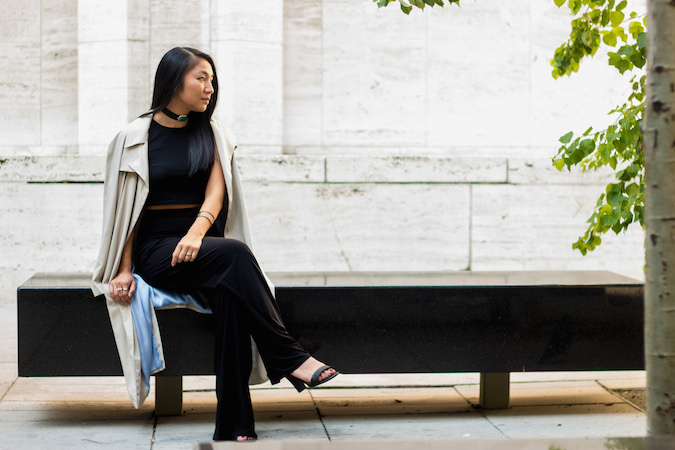 Since my wardrobe gravitates towards monochrome, I've created an easy necktie look with my Coutourist scarf to add a bit of personality. Thank you so much for following along on this Coutourist journey for the past five weeks! This has definitely been one of the most creative projects I've worked on for Looks by Lau, and it has been so exciting to share it with you. To take part in your own Coutourist Challenge, use the code MTB003 for free shipping on your purchase! Coutourist will also be sending a free gift to the first 10 shoppers who use the code, so get shopping! Disclaimer: This post was written in collaboration with Coutourist. All opinions are my own. 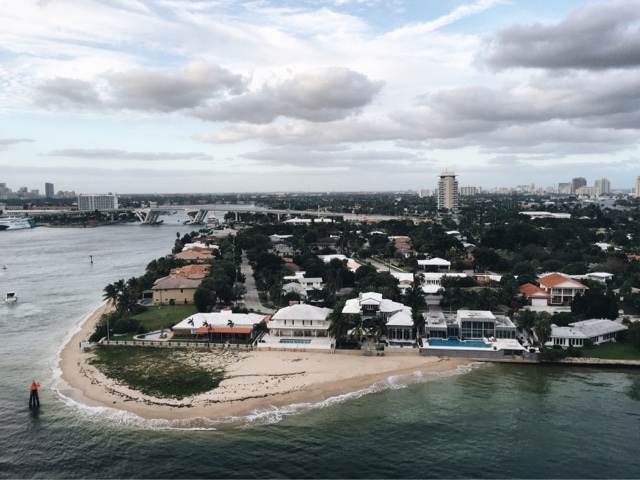 I'm the kind of traveler who prefers to have each day planned out perfectly, but we all know that every trip comes with its unexpected diversions. Because of this I like to make sure my outfits are ready for everything from weather changes to spontaneous plans. Today I'm sharing a look that can take you instantly from sightseeing to fine dining, including the travel-friendly hair tool by Irresistible Me that your carry-on will thank you for. In true Coutourist fashion, I took my scarf down south this weekend on a brief weekend getaway with family by the lake. 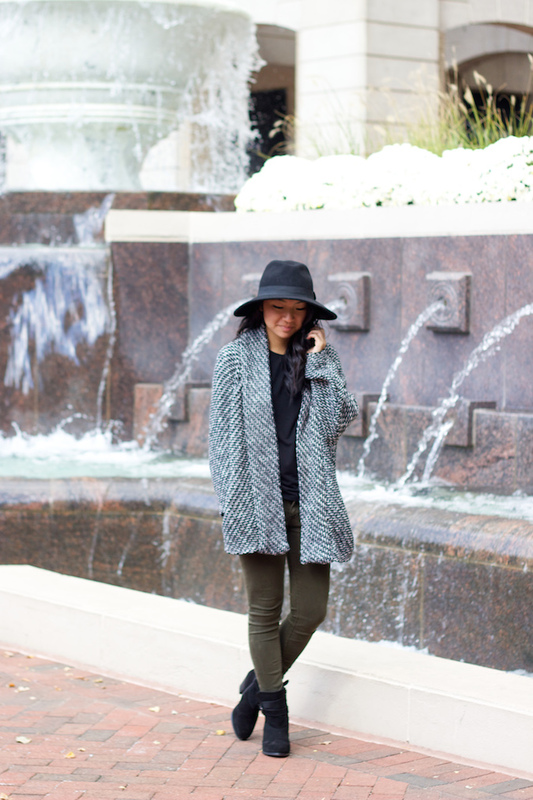 Today I've styled my piece with key fall wardrobe staples fit for any occasion for Week 4 of The Coutourist Challenge. From an evening necklace to a statement headscarf, the Coutourist scarf takes on any shape to take on everything your day may bring. PS. Read the full post for an exclusive free shipping coupon code! Take your little black dress from day to night with an easy accent belt. 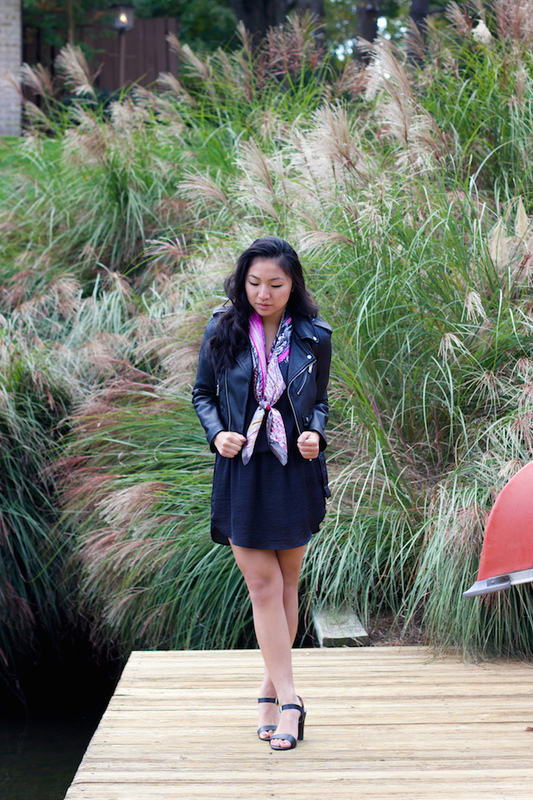 Using the skinny fold, your scarf becomes a versatile accessory to dress up more than just your neck. It's safe to say I'm not a pants girl. With short legs and the thighs of a former dancer, I typically dread shopping for fall/winter bottoms. Since New York is still welcoming some transitional weather, I'm taking advantage of every last opportunity to make use of my summer wardrobe. 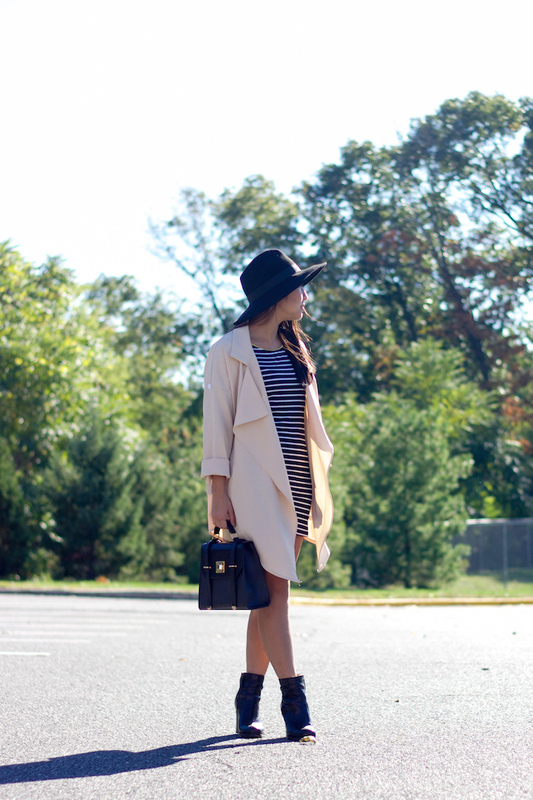 Versatile pieces like this striped number are sure to stick around for a while. 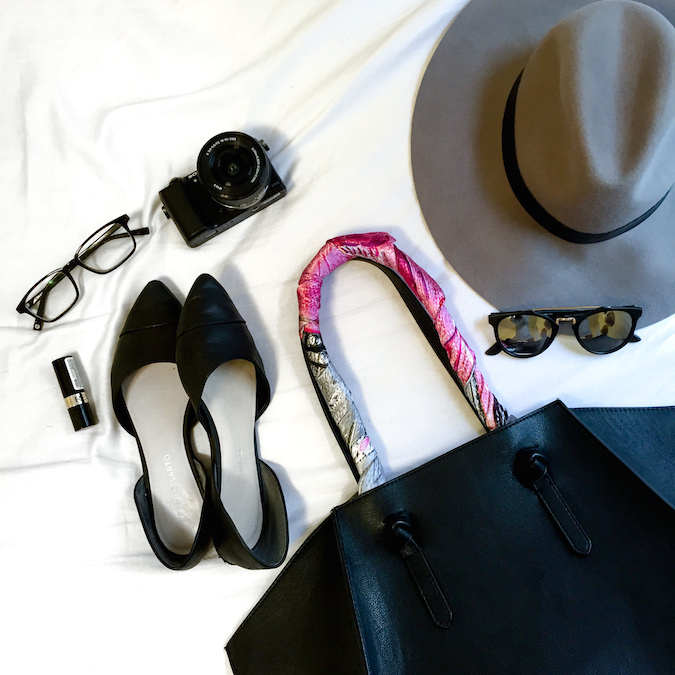 Packing a light bag is every girl's travel struggle, but with Coutourist and a little creativity it becomes an easy feat. 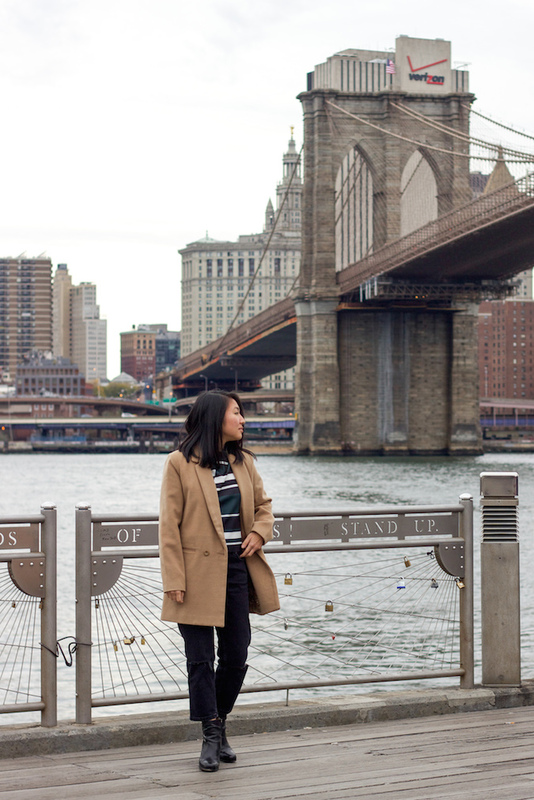 For Week 3 of The Coutourist Challenge, I've styled my favorite scarf with just a top, coat, and two bottoms to create six more everyday looks. With the combination of simple wardrobe staples and a great statement piece, you won't have to worry about repeating outfits or overloading the luggage. The Seventies trend has been one of my favorites this fall, and now getting the look is made easy with the help of Coutourist. By simply giving a long, skinny shape to the scarf, your outfit instantly becomes on-trend without having to break the bank.